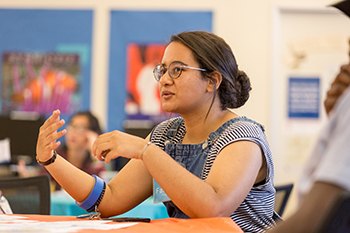 Peers in Pride mentors Ai Nakamura and Abdullah Deen work with incoming first-year and transfer LGBTQI students to help them acclimate to SJSU. Ai Nakamura and Abdullah Deen discovered SJSU’s PRIDE Center in their first days at SJSU, Nakamura during Admitted Spartan Day and Deen during freshman orientation. They both were interested in connecting with the LGBTQI (lesbian, gay, bisexual, transgender, queer and intersex) community at SJSU and in connecting with a mentor. Deen was partnered with a mentor through the Peers in Pride program. Now a junior general business major, Deen is mentoring four new Spartans. Nakamura, a third-year computer science student who identifies as queer, also has four mentees. 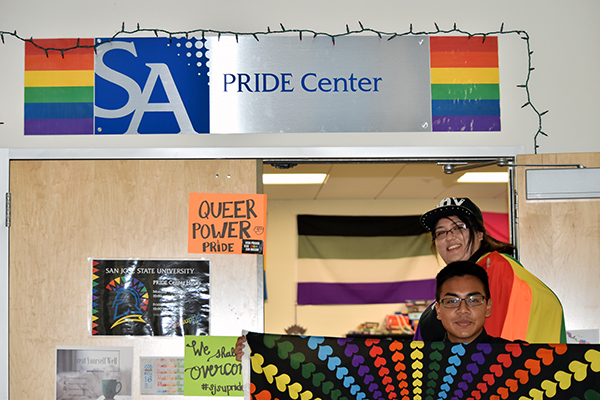 Nakamura stressed that the Peers in Pride program is a way to create a community for LGBTQI students while also drawing campus members to the PRIDE Center. This fall, 13 mentors are working with 40 mentees. The Peers in Pride mentors undergo training with counselors from SJSU’s Counseling and Psychological Services to help them work with students who may be questioning their sexual orientation or gender, or who are dealing with personal challenges, such as lack of family support. They are trained about campus resources – both personal and academic – that they can refer students to when they need additional support. The mentors work with mentees during the fall semester, planning group activities at the PRIDE Center and also engaging one-on-one. Activities include barbecues, game nights and other monthly events. Deen, who has not come out to family members, and Nakamura, who has told select relatives, understand the pressures other students may face. Nakamura described one student who came out right before college whose family cut them off financially. The student was concerned about how they would be able to afford college. Deen said another struggle is that students who are not out with their families can’t share some of their achievements such as participating in the Peers in Pride program. Nakamura and Deen both agreed that a big part of the program is helping other students connect to the LGBTQI community. In addition to involvement in Peers in Pride, Deen is active in the student organization Queer and Asian. With the Pride Center, the group is planning a Queer Prom in the spring on March 24. 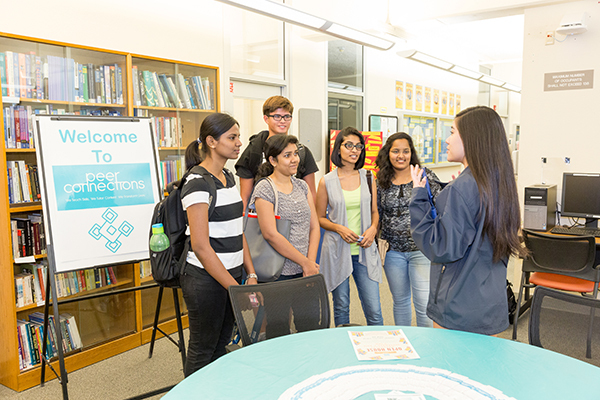 Students visit Peer Connections location in the Student Services Center during an open house event in September. The program offers mentors and tutors. During a Monday afternoon just before finals week, SJSU’s Peer Connections mentors and tutors were gathered at small tables in the Student Services Center, ready to help other students with last-minute study support. Sana Rahim, a third-year business marketing major, and Fatema Elbakoury, a fourth-year English major, were waiting for drop-in appointments. Blake Lonero, a senior psychology student, learned about Peer Connections through his own mentor as a freshman. The program provides mentors and tutoring services to Spartan students at three locations on campus – the Student Services Center, Clark Hall and Living Learning Center in Campus Village B. “I wanted to get involved with Peer Connections because I ultimately want to become a teacher and knew that I would be able to gain valuable experience,” Lonero said. The best part of having a mentor for other students is the emotional and academic support they provide, he said. His favorite part of mentoring other students is when he can persuade them to try out a resource on campus that will help them. “Peer Connections is a valuable asset to ease the experience of being a student and I hope that everyone takes advantage of the services that we offer,” Lonero said. Rahimeh Ramezany, a communication studies graduate student specializing in intercultural communications, said she has gained skills as a tutor that will help her in the field of education after graduation. Joyce Lum, a senior business administration major, said she first learned about Peer Connections from a friend who worked there. At first, Lum struggled with being a full-time student, being involved on campus and juggling two jobs, including working at Peer Connections. Her supervisor noticed and offered her guidance, teaching her that it was okay for her to seek out help, too. A Peer Connections mentor works with students during the beginning of the semester. As 2016 comes to a close, I am grateful for the multitude of ways I see Spartans regularly supporting other Spartans. Our students, staff and faculty are engaged directly and collaboratively in efforts that benefit other campus community members. At the Academic Affairs Staff Appreciation Breakfast this fall, we continued our practice of “Full Circle Giving.” In the past two years, staff and administrators have donated to SJSU’s Student Hunger Fund, contributing more than $11,000 to help students who struggle with food insecurity. These gifts enable students to focus on their studies without worrying about where they will get their next meal. During this holiday season, I am especially thankful for how students, faculty and staff generously contribute their time and talent to fostering the success of other Spartans. I am pleased to share in this newsletter stories of students mentoring other students and helping them find their footing at San Jose State University; emeritus and retired faculty who are providing grants to further the research of current professors; and the many ways donations from faculty and staff to our Spartans Supporting Spartans campaign help fuel student success. I appreciate your support of Spartan causes above and beyond your job duties, and I look forward to seeing more of this generous Spartan spirit in the new year.